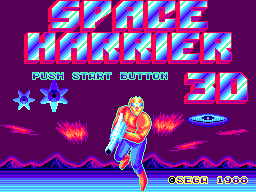 So after the original Space Harrier made it debut, fans amongst Sega realized the power that the master system was capable of pulling off. So it's no surprise that Sega wanted to utilize it's Segascope 3D peripheral for this great looking game to improve it's already action-packed gameplay and novelty. Like the original, your perspective is a behind the player in a third-person shooter-style similar to games like Afterburner and Thunderblade. Though the frame-rate seems a little slower, it's reasonable because it redeems itself. It's 3D, and that in itself improves the gameplay drastically by drawing you in so deep that you feel almost in the game. The controls are relatively responsive, and the D-pad never feels sticky. In conclusion it's 100% playable but be warned it's incredibly difficult. Now this is definately where this game shines, because it improves from the last game in so many ways. There are now detailed 3D backgrounds, and all the enemy projectiles feel like they're hitting you in the face. The new enemies such as space ships, an assortment of evil looking heads, and giant missles looking great, and all the bosses look amazing in 3D! This is easily one of the best looking games for the Sega Master System. Yet again we see improvements, more sounds and revamped music. Although the first level, as other levels, shares the same old memorable space harrier BGM, it's sounds work more than on the original. In addition, this has some catchy music. 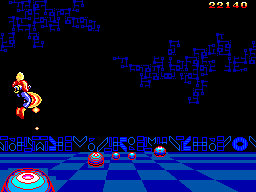 There is also additional music for other levels, which was not like the orignal Space Harrier. 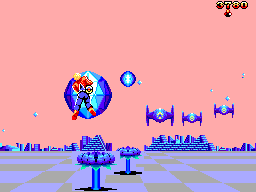 As I said before, it's plays pretty much the same as the original space harrier. The controls are on the ball. The replay value in this game is definitely hightened due to the increase in novelty value and immense difficulty. I just got the game not too long ago and I'm stuck to it like glue, and I know all Sega fans will appreciate it too. This game is simply fun, and is a must for SMS collectors. It's probably the best 3D game I've ever played on the Sega Master System and is a great step-up from the classic from which it was born. It's tough to get this game and it's a little expensive, but if you keep a close eye try to grab a cheap copy, you won't be disappointed.